I’m wondering if the box will be a regular sized game box. Anybody have any clue? If you take the last 2 expansion boxes - Invaders from Afar & Wind Gambit - and put them side-by-side, that will be the size of the expansion box for Scythe: The Rise of Fenris. As long as it fits into the Legendary box I'm ok with it. I read the size of IFA and TWG together as well. 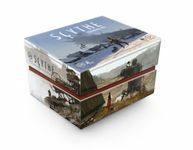 In any case, Scythe and all expansions will fit in The Legendary Box. Just to clarify, the boxes of the expansions aren't meant to fit inside the Legendary Box, just the content of those expansions. that was something I missed when I bought the legendary box. Im a little disapointed because it would have been a really cool slotting together of everything. I just don't want to discard the beautiful boxes. But you're discarding the original Scythe box in favor of the legendary box, no? I know if I buy the legendary box, I will not be able to bring myself to throw away the other boxes - they're just so darn beautiful. I know if I buy the legendary box, I will not be able to bring myself to throw away the other boxes - there just so darn beautiful. Put the two empty expansion boxes inside the empty original box and tuck that under the bed. Or keep on the shelf. That is exactly what I did! I have the old box on display! This is disappointing to me. The fact that there is enough content to fill a larger box is cool, but Invaders from Afar and Wind Gambit are each approximately 1/3 the size of the normal Scythe Box. As soon as I heard there was going to be a third expansion, I was very excited to be able to store my three expansions on top of the main box, on its same footprint. Again, the response to this complaint will be, "you're whining that there is too many components?" I guess that's the upside. I just thought that it was going to make sense to have three identically sized expansions, each 1/3 the size of the main box. Oh well. All the expansions and base game will not fit in the original box, however, you can buy the Legendary Box by Stonemaier games. [q="dboyee"]I just thought that it was going to make sense to have three identically sized expansions, each 1/3 the size of the main box. Oh well. Even if the each expansion was 1/3 the size of the main box, all the components still would not fit in the main box. I have the first 2 expansions in the main box and the box is full to the brim. There is no more room for anything additional. I think what he meant was that if all 3 expansions had the same size of box, then on his shelf he could store the base box and neatly stack the 3 expansions on top. Fenris is going to mess with that a little. Personally, I have Invaders rolled into the base box just fine, so it should be fine for me, but I can see that disappointment. Hopefully the content will be sufficient to offset any disappointment from storage difficulties! Oh... I totally misread that! However, the legendary box will solve that problem too!